Syphilis is a sexually transmitted infection caused by the spirochetal bacterium Treponema pallidum, subspecies pallidum. During early syphilis, the spirochete has the ability to disseminate into the central nervous system and cause both symptomatic and asymptomatic meningitis and in more severe cases vasculitis leading to thrombosis, ischemia, and even death. During tertiary syphilis, the chronic inflammatory responses to the spirochete can severely compromise the brain parenchyma and the spinal cord, leading to paresis and tabes dorsalis. 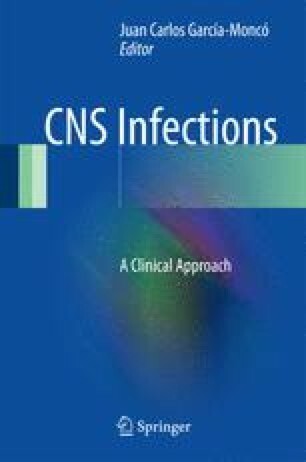 In this chapter we will review the clinical presentation, diagnostic criteria, and treatment modalities for neurosyphilis. Sexually Transmitted Disease Surveillance 2011. U.S. Department of Health and Human Services. 2012. The online version of this report is available at http://www.cdc.gov/std/stats. European Centre for Disease Prevention and Control. Sexually transmitted infections in Europe 1990–2010. Stockholm: ECDC; 2012. (http://www.ecdc.europa.eu/en/publications/publications/201206-sexually-transmitted-infections-europe-2010.pdf). Nagappa M, Sinha S, Taly AB, et al. Neurosyphilis: MRI features and their phenotypic correlation in a cohort of 35 patients from a tertiary care university hospital. Neuroradiology. 2013;55:379–88. doi: 10.1007/s00234-012-1017-9. Epub 2012 Dec 30. Ormerod LD, et al. Syphilitic posterior uveitis: correlative findings and significance. Clin Infect Dis. 2001;32(12):1661–73. doi: 10.1086/320766.